Last week, I featured a unique handmade "folk art" doll made by an Southern California artisan some 60-years ago that is for sale through Lelands Auctions (check out that post here). Today, I thought I would point out a few more interesting vintage Dodger memorabilia items that struck my fancy. 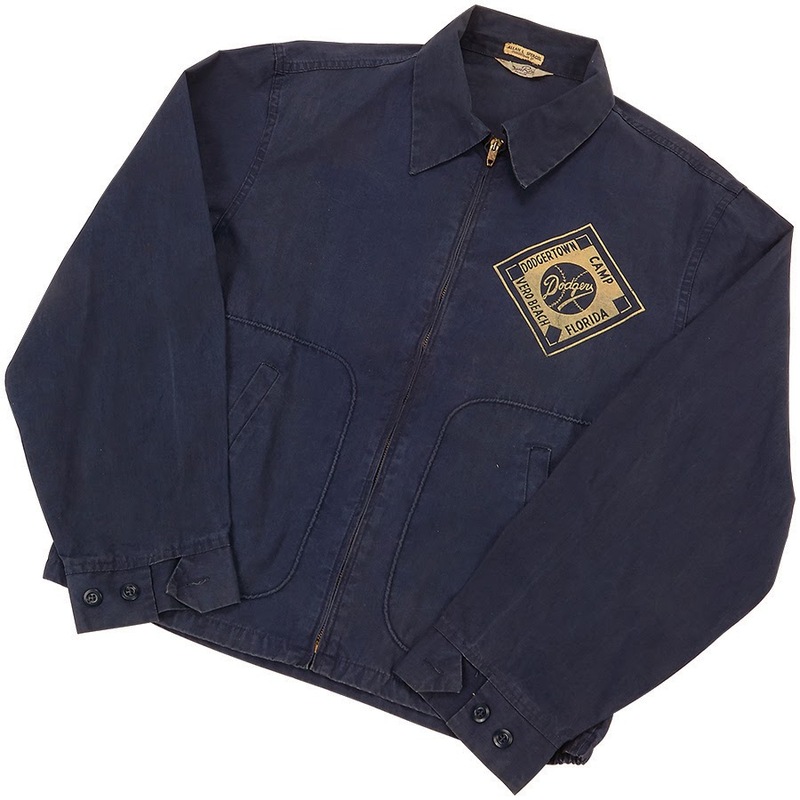 Directly below is a circa 1957 Dodgertown jacket that likely was worn by workers at the former spring training home. It was once a part of the famed Sal Larocca Collection of Dodger memorabilia. I love this kind of oddball stuff. 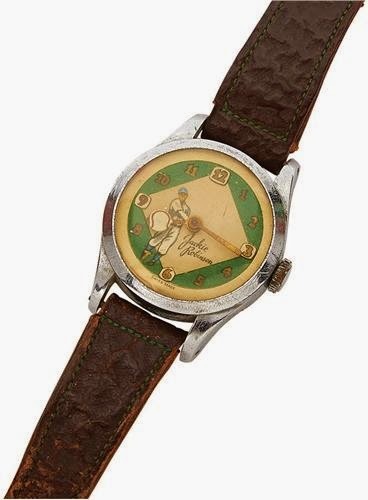 Here is a 1949 Jackie Robinson watch. 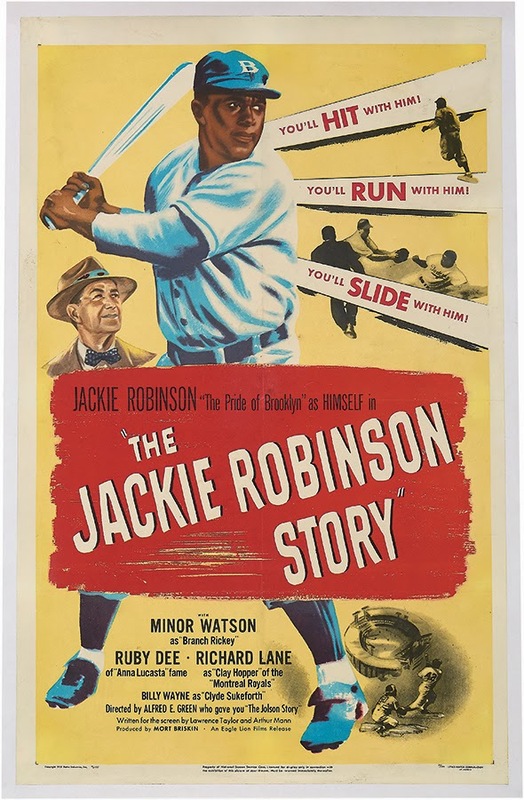 With the recent release of the movie "42" I would bet that this original "The Jackie Robinson Story" movie poster will get a lot of interest. 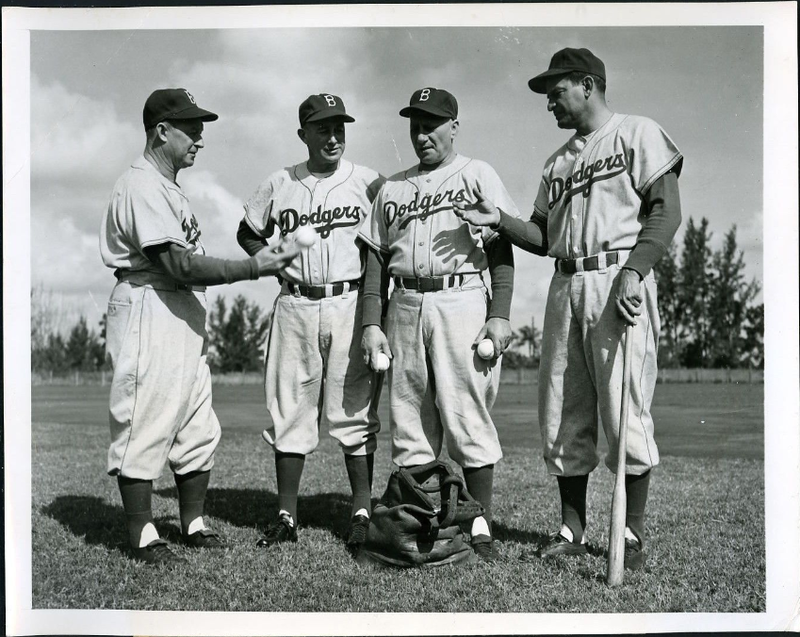 Coaches and Dressen Confer at Dodger Camp; Vero Beach, Florida.... Charles "Chuck" Dressen, new manager of the Brooklyn Dodgers holds a conference with three of his coaching staff at the Brooks Spring Training Camp. Left to right are: Dressen; Clyde Sukeforth; Jake Pitler and Cookie Lavagetto. The photo was originally taken by Herb Scharfman for International News; dated 2/21/1951. As you may know, Scharfman would join Sports Illustrated and is famous for a photo in which he appeared - he is the man seen in the background (between the legs of Muhammad Ali) as Ali stands over a knocked out Sonny Listen. Alex Markle at Chavez Ravining put together his list of, "Top 10 Matt Kemp Cards." ICYMI, there have been rumblings over the weekend that the Orioles, "have engaged in trade talks with the Dodgers regarding Andre Ethier," via Roch Kubatko at MASN Sports. Baltimore appears to have many options, so I wouldn't expect anything to be imminent. At this point, nothing would surprise me, though. The Dodgers have not been shy about wanting to deal Ethier and they are probably willing to make a deal. Via Ken Gurnick at MLB.com, "Acclaimed scout Brito not slowing down at 80." Via Lyle Spencer at MLB.com, "Wills' impact on game is Hall of Fame worthy." Via Anthony DiComo at MLB.com, "Proud of numbers, Piazza awaits Hall's call." "I can only say that there's been a lot of great players throughout history that have had to wait their turn," Piazza said during a phone interview to promote a shaving system, for which he recently filmed a television commercial in upstate New York. "Joe DiMaggio had three ballots. Yogi Berra had three ballots. And that's part of the process. For me, it's not really my place, I feel, to start campaigning. I can only say that I'm proud of my work and I'm proud of my career. I'll put my numbers against a lot of players in history, and I feel that's all I can do." Via Eric Stephen at True Blue LA, "Dodgers 2015 non-roster invitees to spring training." Via Cary Osborne at Dodger Insider, "Seasons: Babe Herman’s 1930 — the year of the hitter." It was that year when a Dodger had arguably the greatest offensive season in franchise history. Floyd Herman, better known as “Babe” Herman, had a monumental campaign for the Brooklyn Robins, one that is statistically jaw dropping. Herman ranked in the National League top five in 12 different offensive categories. His .393 batting average is 12 points better than any other in franchise history. (Herman hit .381 in 1929.) Herman finished second in the NL batting race to Bill Terry, who hit .401 that season. Via Rich Mueller at Sports Collectors Daily, "Roadshow Segment on Rare Collection Airs Monday (today)." The segment was taped on Roadshow’s first trip to New York City in 13 years. It reveals the largest sports memorabilia find in the 19-year history of the series: an archive of rare Mort Rogers Scorecards with a handwritten letter from the 1871-1872 Boston Red Stockings.